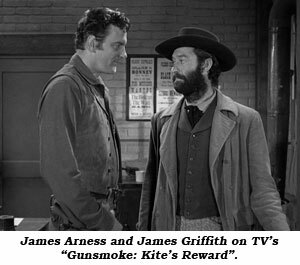 Hungry looking, spindly-lean James Griffith portrayed many roles on screen that were a far cry from his real warm human being persona. 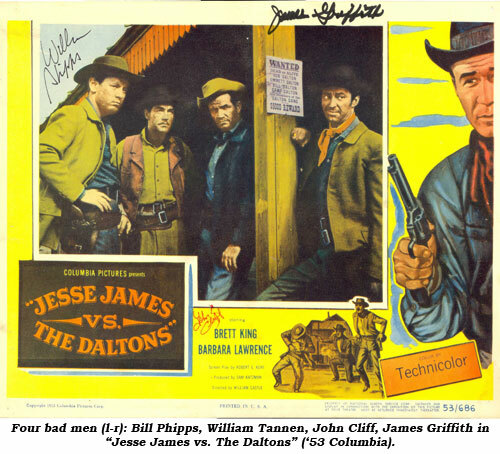 James Jeffrey Griffith was born February 13, 1916, in Los Angeles, California, the son of a boat builder who worked at Fellows and Stewart in Wellington. His mother’s father was pure Scotch, his mother’s mother pure Irish, his father’s father was pure Welsh and his father’s mother was the daughter of a British admiral. Jim’s early childhood was spent in San Pedro, California, where he appeared in his first play at a Methodist Church before he was even in kindergarten. When the family moved to Balboa, Jim worked at the Newport Harbor Yacht Club as a bellhop. With the crash of ‘29, hard times hit the Griffith family so they sailed away in 1930 to Tahiti where they lived for a time. Returning to Balboa in 1931, his parents were divorced and Jim and his sister moved with his mother to Santa Monica to live with his grandmother. In his junior and senior years of high school Jim played clarinet in the orchestra. He also played in the Santa Monica Symphony in the winter season. After high school, Jim joined the Marine Corps intending to go in as a musician, instead spending a year and a half in a howitzer outfit. He was later transferred to Pearl Harbor as a member of a 28 piece band. During this period he performed in many community theatres. Following his hitch in the Marines he was hired by the San Diego Sun as a reporter while he performed in plays with the Barn Players. This brief career was interrupted near the close of WWII when Jim was recalled into the Marines until his discharge in 1947. Jim found work pumping gas at a Standard Oil station in Westwood. A chance encounter with customer Spike Jones found Jim performing with Jones’ wacky musicians. 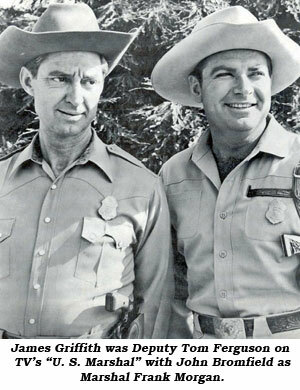 Still working with Jones and holding down a shift at the gas station, Jim made his first film, “Blonde Ice”, in 1948. From this time on film roles and TV work kept Jim busy. 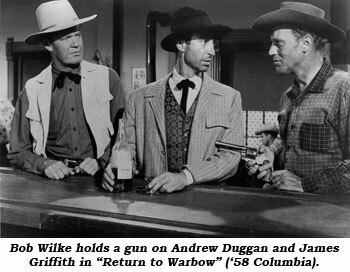 His first western was “Daughter of the West” (‘49), the script of which Jim and his friend Jack Daley re-wrote to make it serviceable. 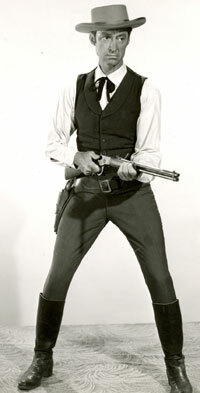 In 1950, Jim became a regular performer on most of Gene Autry’s Flying-A Productions—“Range Rider”, “Gene Autry”, “Annie Oakley”, “Buffalo Bill Jr.”. 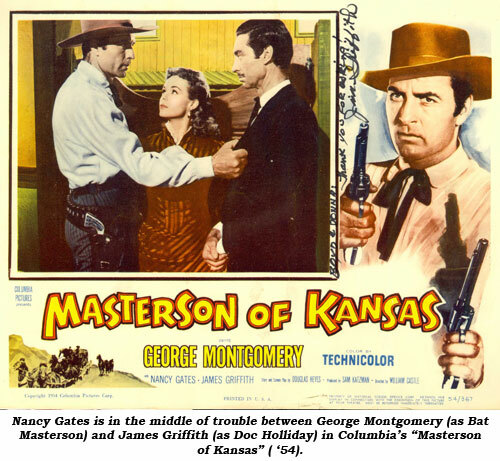 Besides his busy acting schedule over the years, Jim collaborated with Hal Hopper (who once sang with the Pied Pipers) on scripts and title tunes for a couple of movies. Jim worked on the scripts of “Shalako” (‘68) and “Catlow” (‘71) under the name J. J. Griffith. Over time he also penned the story for “Motor Psycho” (‘65) and scripted certain episodes of “The Fugitive” and “Mission Impossible”.